Week 10 starts in a few hours, so while we can, let's finish cleaning house on Week 9. Down by three with ten seconds remaining, the 49ers were one yard away from the St. Louis end zone and appeared on the verge of victory. But Colin Kaepernick fumbled in what was not only the most detrimental play of this week, but was the most disastrous play since 1999 when Brian Burke of Advanced Football Analytics began tracking play-by-play data. 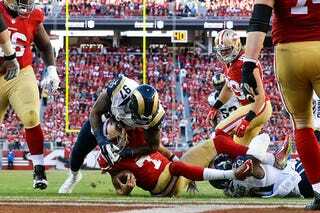 The play lowered the 49ers' Win Probability 83 percentage points from 84 percent to 1 percent, as the Rams ended the game with a kneel the next play. Burke's Win Probability measures a variety of things, like time remaining, score, down, and distance. This Win Probability chart shows just how drastic the play was. That huge uptick toward "SL Win" near the end of the game represents the fumble. Kaerpernick's fumble edges a missed 32-yard field goal in 1999 by Adam Vinatieri as the costliest play in Burke's dataset. The missed kick came against the Chiefs with nine seconds remaining, and lowered the Patriots' Win Probability 81 percentage points from 82 percent to 1 percent. The field goal would have gave the Pats a victory, but instead Kansas City won 16-14. Back to this week's plays, the most helpful play was Matt Asiata's go-ahead touchdown run near the end of the fourth quarter. The touchdown and extra point gave Minnesota a 29-26 lead over Washington, which ended up being the final score. It raised Minnesota's Win Probability 23 percentage points from 31 percent to 54 percent.